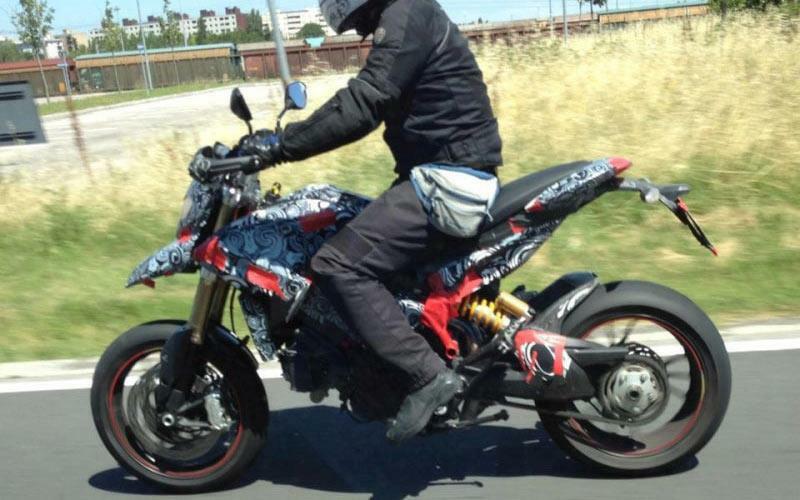 ﻿ Spied: New Ducati Hypermotard and Multistrada? A second spy shot of a new water-cooled Ducati Hypermotard testing near the Bologna factory in northern Italy has led Ducati insiders to hint there will be two new bikes arriving. The prototype clearly introduces a new engine for the Hypermotard range which appears to be based upon the 848cc Testastretta 11 motor, as found in the new-for-2012 Streetfighter 848. That means a claimed power of around 130bhp which is a huge step up over the current (and already potent-feeling) 95bhp from the most powerful Hypermotard 1100Evo. The first spy shot was seen six weeks ago as an early prototype was snapped by a professional spy photographer being wheeled about at the back of the Ducati factory’s Research and Development section. At that time MCN raised the possibility that the bike everyone assumed was a replacement for the Hypermotard could actually be a mini-Multistrada using the 848cc V-twin from the 848 supersport machine. Now a second photo of a different bike has led Ducati insiders to confirm the hypothesis. There will be a direct replacement for the current Hypermotard, along with a Hypermotard Touring – essentially a mini-Mulltistrada –which will have a bigger windscreen and luggage. For more info on the new Hypermotard and possible new Multistrada pick up a copy of the June 27 issue of MCN.